PayPal, the pioneer of online payments, clearly wants in when it comes to the hip new world of peer-to-peer money transfers—after all, it did acquire Venmo back in 2013. But if you're not so sure about sharing your personal transactions in Venmo's social feed, you can still transfer money to friends and family using PayPal's mobile app. PayPal boasts some distinct advantages compared to the more casual peer-to-peer money-sending apps, chief of which is its lax sending limits and buyer/seller protections for purchasing goods and services from strangers. On the other hands, splitting bills is a hassle, and prepare to pay extra if you want to send money using a debit card. PayPal may be the biggest app, but there are unique talents among the competition. Check out the other mobile payment apps we reviewed. Getting started with the PayPal app is a tad more involved compared to the processes for other apps we've tested. Besides your name (including your legal first name), email address and phone number, you'll also need to enter a street address. In all, there are nine blanks you'll need to complete before you can sign up. Once that's done, you can link a debit card, credit card, or a bank account to the PayPal app. Thankfully, the app will let you snap a photo of your plastic to make it easier to enter your card numbers and expiration dates. Front and center on the main PayPal app interface are two big buttons: one for Send Money, another for Request Money. Tap a button, pick a friends (just one), enter the amount, specify a funding source (one of your debit cards, credit cards or bank accounts), add a note to your payment or request, then tap Send Now. 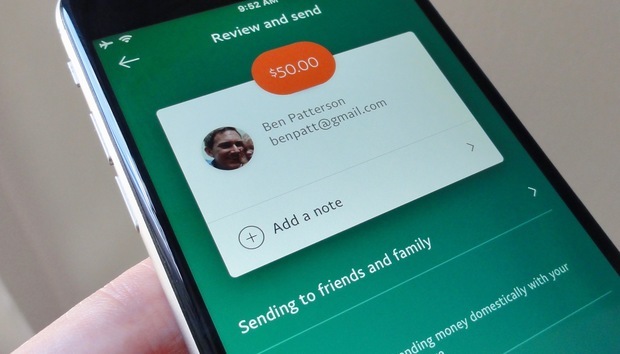 Just tap Send Money or Request Money to exchange cash with friends using the l;=PayPal app. There's no way to split a bill using the PayPal app, short of sending separate requests to your friends. The good news, though, is that your friends don't need a PayPal account to pay you, thanks to PayPal's "pay as guest" feature. 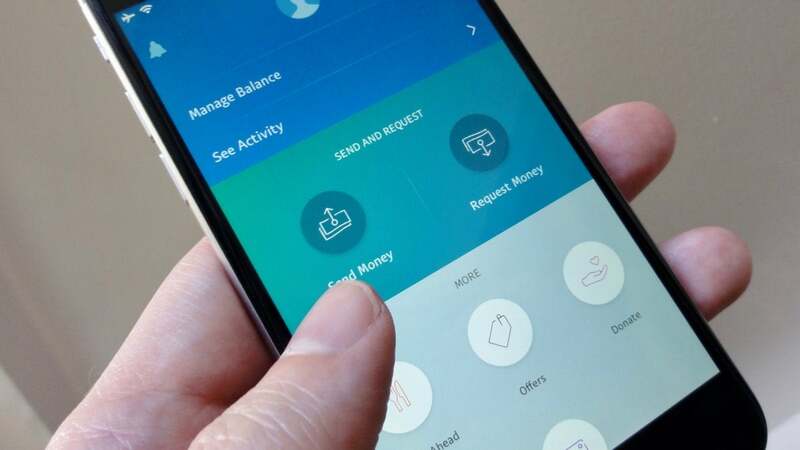 PayPal doesn't offer many details on the secret sauce it uses to set spending and receiving limits on personal PayPal accounts, but in general, they're considerably more lax than we found with other peer-to-peer payment apps in this roundup. I created a test PayPal account with my address but no bank cards or accounts, and according to my PayPal profile, I was free to send as much money as I wanted, in stark contrast to other services which cap payments anywhere between $2,500 to $10,000 a week. A PayPal support page notes that individual transactions are limited to $10,000, but the PayPal app seemed perfectly willing to let me send myself $10,001 in a single shot. (I backed out before tapping the "Send now" button.) It's worth noting, though, that withdrawals on my account were capped at $1,000 a month, even after I'd linked a debit card and a bank account. One more thing to keep in mind, and it's a big one:Uunless you're drawing funds directly from a bank account, it'll cost you to pay someone with the app. Expect to pay 2.9 percent plus 30 cents for transactions using a credit card or even a debit card. Most of the mobile payment apps we reviewed let you exchange money using a debit card for free. Similar to Square Cash and it's "$Cashtag" web pages, PayPal offers public "PayPal.me" pages that let people pay you on the web, no PayPal account needed; all you have to do is share the URL of your PayPal.me page to get paid. Also, PayPal is currently beta-testing "instant" deposits for users with "eligible" debit cards, meaning your cash could be deposited in your bank account within minutes rather than the usual one to three-day wait. Nice, but there's a catch: Each instant deposit will cost 25 cents. PayPal demands your password each time you launch its mobile app, an annoying but ultimately prudent feature. You can also use touch ID to unlock the app or create a PIN. 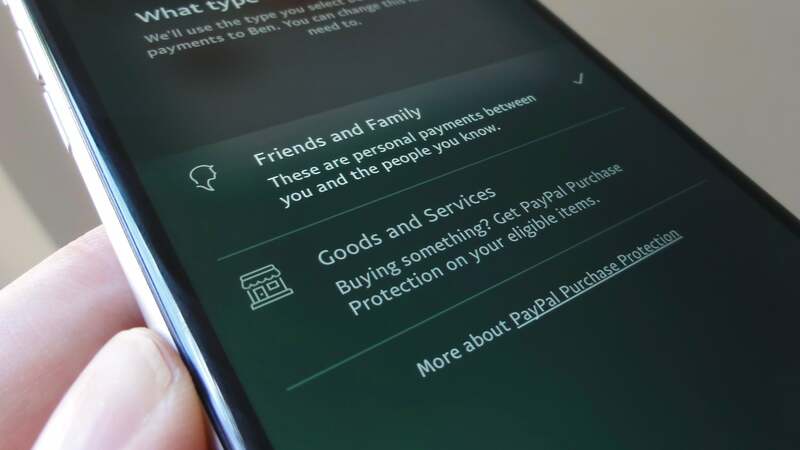 Unlike most of its P2P-payment competitors, the PayPal mobile app boasts a safer way to pay strangers for goods and services, as long as you pick the right payment option. As opposed to the other money-sending apps in this roundup, you can safely use the PayPal app to buy goods and services. Just be sure to select Goods and Services when you're composing your money request. Once that's done, your purchase will be covered by PayPal's buyer protection policy, which offers refunds for defective, missing or fraudulent goods. PayPal's mobile app makes for one of the more secure ways to send and receive cash from friends or even strangers. But you're on your own when it comes to splitting the bill, and debit card transactions will cost you.